South Korea’s export prices strengthened at the fastest pace in eight months in March on the back of the weakening won and rising oil prices, but the export prices of semiconductors, the nation’s mainstay item, fell for the eighth consecutive month, government data showed. 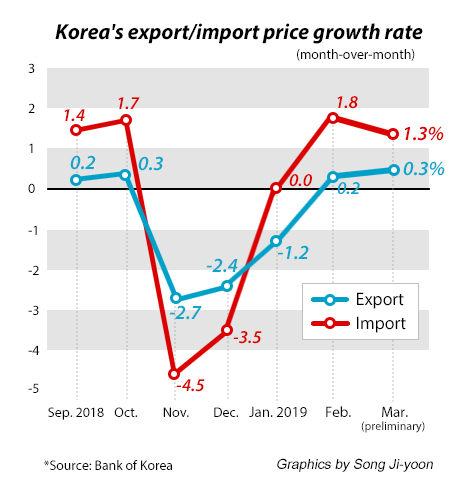 According to data released by the Bank of Korea (BOK) on Friday, the country’s export price index gained 0.5 percent from the previous month to 83.36 in March, maintaining the winning streak for two months in a row. The gain was the biggest since July last year when it had increased 2.5 percent on month, thanks to the depreciation of the Korean won against the U.S. dollar by 0.7 percent. Because export and import prices are recorded in Korean won, the weaker the won against the dollar, the higher the export prices. The growth was also driven by the strengthening oil prices. The nation’s benchmark Dubai crude rose 3.6 percent from the previous month to $66.94 per barrel in March. Export prices of electrical and electronic devices, however, slipped 0.5 percent on month. In particular, the country’s key export item dynamic random-access memory (DRAM) chip prices tumbled 5.2 percent, extending its losing streak into the eighth month in March. But the central bank said the softening pace has been slowing down, from 14.9 percent on-month drop in January to 6.9 percent in February. Semiconductor prices including those of DRAM and NAND flash memory chips went down at a slower pace of 3.4 percent last month, after falling 4.3 percent in February. The easing decline contributed to the smaller retreat in the prices of electrical and electronic devices, which had sunken 3.6 percent on month in January and 1.7 percent in February. The import price index in March rose 1.3 percent from a month ago to 87.61, maintaining the gaining pace for two months in a row due to higher global oil prices, according to the BOK. Import prices of raw materials grew 1.2 percent and intermediary goods 1.6 percent. Prices of capital goods and consumer goods edged up 0.6 percent and 0.7 percent from a month ago, respectively. After removing the effect from foreign exchange rate, export prices were down 0.2 percent and import prices were up 0.6 percent. The trend of rising oil prices would boost both export and import prices in April, the central bank said.